It may seem a little strange to think about rules for playing slots. For most, they assume they just sit down, place their bet, and activate the spin. This is repeated until the slot player no longer wants to play. There are rules for playing slots which pertain to what each slot machine consists of. Every casino no matter whether online or on land will have their own house rules. These apply to everything that takes place in the casino. The slot machine rules are those that apply to how each of the slot machines operates. It applies to the different segments of the game. There will be rules set by the machine as to how much you can bet. This will usually vary between a minimum amount to a maximum. There may also be a choice of how many lines you want to bet on. You may be playing on a 50 line slot. The rules of that slot may say that you can bet on just one line, or bet on every line. The games’ rules will outline what it is you need to do to win. Every slot game will have its own winning combinations. You will want to know what it is going to take for you to win some money. Many of the slot machines now come with a variety of bonuses. You need to know the rules for these bonuses so you understand their payouts. For example, one rule may be that you need to collect three of the same icons. If you do then you might get a bonus of ten free spins. These are the rules for that specific bonus. 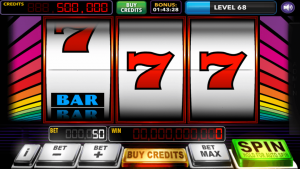 Review each slot game carefully to determine what the slot rules are for that particular game.